Not just any nail will do … Using the right type of fastener will make a world of difference in treated-wood projects. The Choices aren’t the same as they used to be. 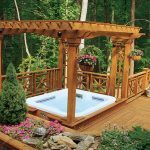 The phase-out of arsenic-treated lumber makes decking choices challenging.